1. Take a big goal and break it up. Sometimes, big resolutions can seem overwhelming or like you don’t know where to start. Think, how can I push forward on this goal this month? What about next month? Set smaller goals for each month to ensure you stay on track all year! Recap your successes from last year! Take note of all the things you are most proud of from last year. When making resolutions for the new year, we tend to focus on things we want to change. There’s something to be said for bringing in more positivity and taking the time to feel great for all the things you accomplished and improved last year! 2. Set a focus word for the year. This is a trending idea that works on the idea that instead of making hard set resolutions, you come up with your FOCUS WORD of the year. I’ve been thinking for a few weeks now on what I wanted my word to be. Where I wanted to put my focus and set my intention and I’ve been pulled towards the word Kindness. Twoards others and towards myself. I want to wake up every day and ask myself, “how can I be kinder today?”. It’s hard to track a goal like “Be kinder”, or “Don’t get upset so quickly”, but setting my focus of the year on kindness will allow me to be mindful of what I do that day and how I can work on being kinder every day. 3. Finish what needs finishing. Do you have some projects left behind from last year that you can check off quickly? If so, do it as soon as you can. Dragging around projects we need to finish makes us heavy and weighs down our creativity and spontaneity. Don’t get trapped in last year’s to-do list, get out of it quickly so you can tackle our new goals for the year! This January, focus on your health, on your body, on your mind and on your sanity. You’re being pulled in many directions at the start of the year. Work has new goals for the year, your children have birthdays coming up and you said you’d volunteer at the next bake sale. Whatever it is you’ve got on your plate already, take the time to take care of you. Your future calmer you will thank you for it. 5. Figure out your WHY. Why are you doing this? Why will you not do this? Why are you working towards this goal? Why that other goal? It’s easy to get in the mindset of picking a goal and figuring out how you’ll achieve it, but if I learned one thing from last year it is that knowing WHY you are doing something is a much more powerful motivator than simply knowing how you’ll do it. If you have any other tips, send them my way. I hope these will help in making sure you get all you can out of the first month of the year to start the new year off in the best way possible. Awesome tips. 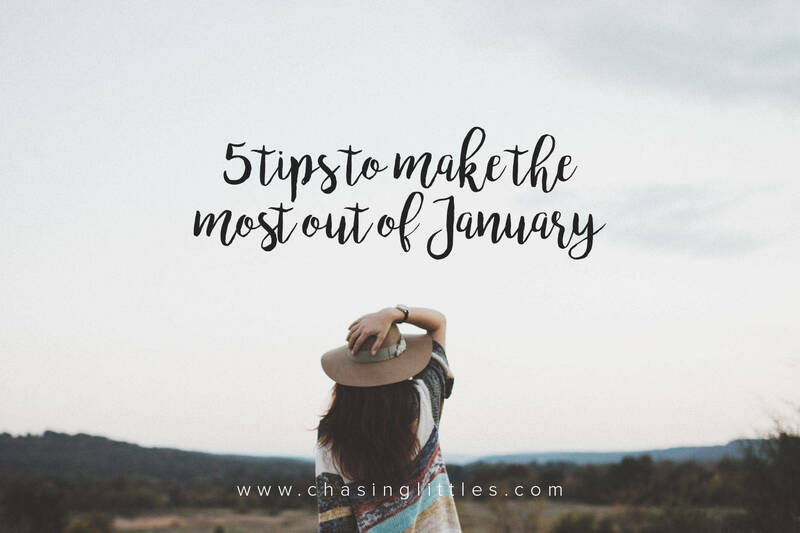 I’m working on #1 right now – I have all these big goals I want to accomplish this year with the blog/business, but thinking about them gets overwhelming. So I’m trying to write everything out and break it down by month/week/day so that I can actually take those tiny steps that will add up to meet the big goals! Breaking it down like that will be great for you! Also a good reason to get a kickass planner! haha! Best of luck with all your goals! These are all wonderful tips! I like the part about putting yourself first, especially around this time of the year when things may get super busy!! Exactly! You do you, and prioritize yourself first. Can’t help others if you’re not at 100%! I need to break my goals down. It’s funny – I am all about doing that but for some reason, when I got back into the swing of things this year… I got really stressed and bummed – probably because I didn’t yet break down my goals into smaller ones so I can reap small successes! That has happened to me too! If I have no direction it’s hard to feel excited or motivated! Awesome tips for anyone looking to refocus. I am starting to get back into things after having my baby and it’s been difficult. The “why” is SO important for everything we do! Once we stop having purpose, there’s no motivation/reason to keep pursuing something. Agreed! it’s one of the most important things we can figure out to help us not be able to quit! This is great. I think we all need these reminders throughout the year, not just in January. I love setting a word for each year! This year my word is hope! SOOO many things need finishing D: I need a second January!